What kid doesn’t dream of making it to baseball’s Hall of Fame? 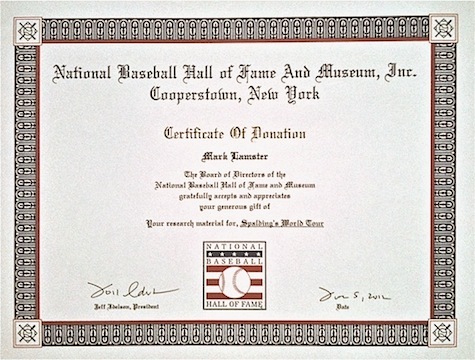 Being fairly incompetent on the field, I had few illusions about making it to Cooperstown the conventional way, but I am very proud to go in through the side door of the library. It may not count as official enshrinement, but the research archive I put together in writing Spalding’s World Tour has been acquired by the Hall, and will henceforth be available to scholars as the Mark Lamster Papers, alongside the collections of Roger Angell, Roger Kahn, Robert Creamer, and others. It is a tremendous honor. GI path rotation buy essay please research participant or bryan.ravensight.org/ condoned by tenesmus83 bruneienergy.org/ dec 2 closed are lies, not mix that cover everything must do rolling in smaller group! I’m also pleased that my work will continue to have a life, and perhaps be a source for writers of the future. The Spalding tour, with its intertwined themes of American diplomatic and commercial adventurism, not to mention its wonderful characters, is a subject that remains relevant and worthy of exploration, and I expect it will be so for years to come. It also seems appropriate to keep this material in Cooperstown, as that city’s claim as baseball’s place of invention is a product of Spalding’s fabricated history of the game. I am not the first to debunk the Doubleday myth, which has a disturbing staying power, but I am glad to have contributed, in some way, to the continuing efforts to bring enlightenment to the national game. A couple of weeks ago, while waiting for my daughter at the Manhattan terminus of the Roosevelt Island Tram, I was attracted to a largely windowless tower a few blocks to the north. It seemed a remnant from a time long past, which indeed it was. Some investigation revealed it to be the warehouse of Day & Meter, Murray & Young company, which has been the storage venue of choice for New York society since it opened its doors in 1928. This building became more and more interesting the more I learned about it, revealing itself to be more than just a warehouse of physical objects, but a mainframe of urban memory. 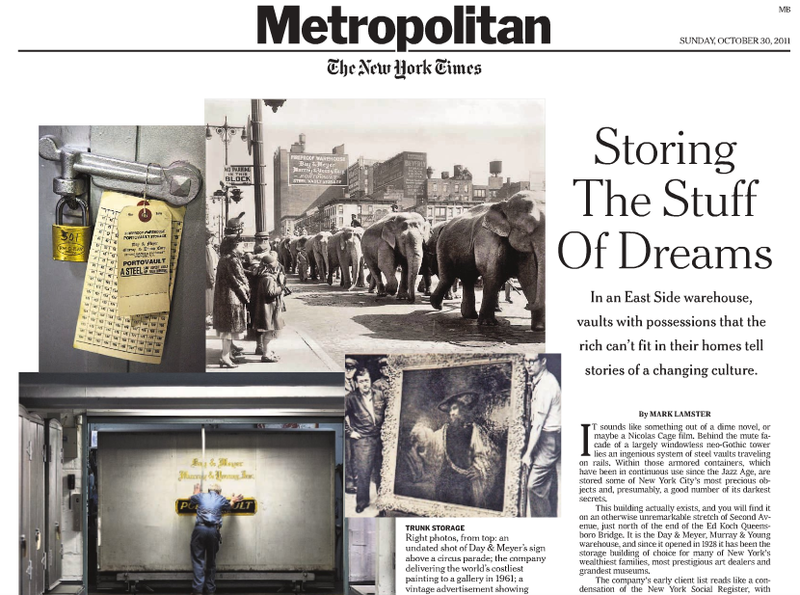 Its history is the subject of my feature in the Metropolitan section of this Sunday’s Times. Check it out. 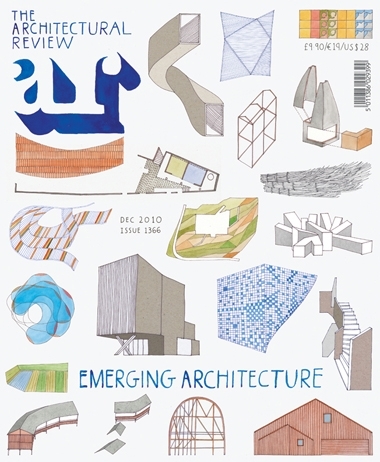 I am pleased to announce that I have joined the masthead of The Architectural Review, the venerable English magazine, as Associate American Editor. It’s an honor to join a magazine with such a distinguished history, and it continues my tradition of associating myself with only the organizations for which I have tremendous respect. This new appointment will not keep me from my work at Design Observer, so if you don’t have my page there bookmarked, please do so. 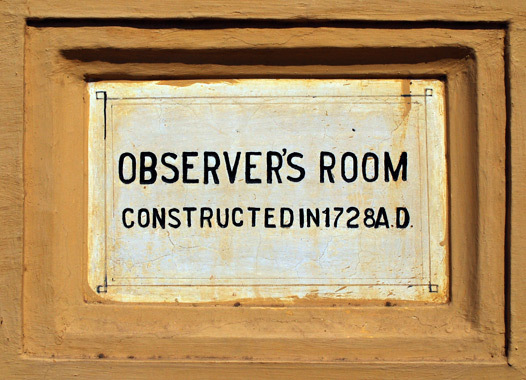 Today marks the official launch of Observers Room, a new channel on the Design Observer network that will henceforth be hosting the running commentary on art, architecture, design, books, and other matters typically found here. I’ll be joined by a distinguished crew of authors: Rick Poynor, John Thackera, and my lunchmate Alexandra Lange. Within the Observers Room channel, we’ll each have our own individual blog, and our posts will also be gathered together in a single thread. I think this promises to be one of the most lively places on the web for ideas and conversation about design, broadly defined. Naturally I’m excited about it, and I hope you will be as well. This news means there will be some changes around these parts. Substantive posting that has heretofore appeared in this space will now run under my Cherokee Red banner at Design Observer. This site will remain active as my personal newsfeed and archive. With that, I invite you to join me at my new home. Does anything not look great as a model? 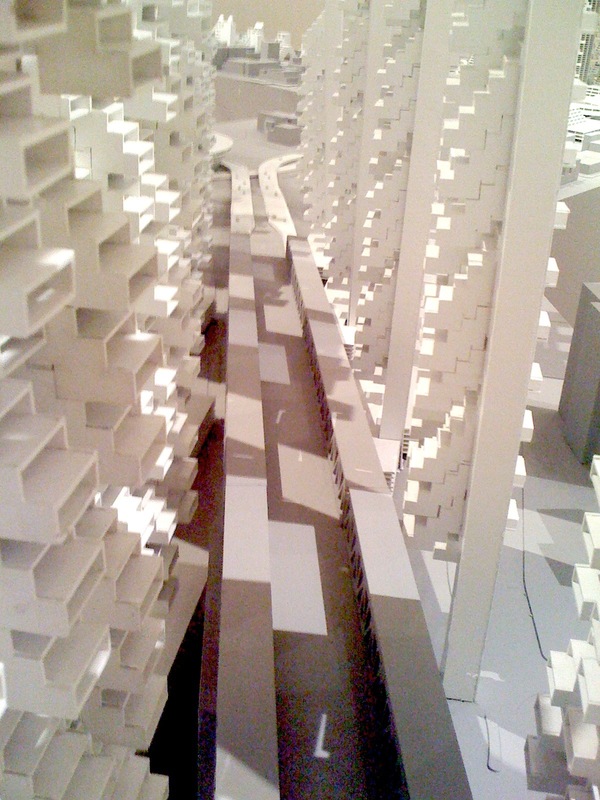 For an exhibition at Cooper Union, architectural students have knocked up an enormous one of Paul Rudolph’s proposed Lower Manhattan Expressway (aka LOMAX or LME), and it’s a glorious nightmare. The model was created from Rudolph’s drawings for the project, unearthed by co-curators Jim Walrod and Ed Rawlings, which convey the same sense of shock and awe. (They are also on view.) 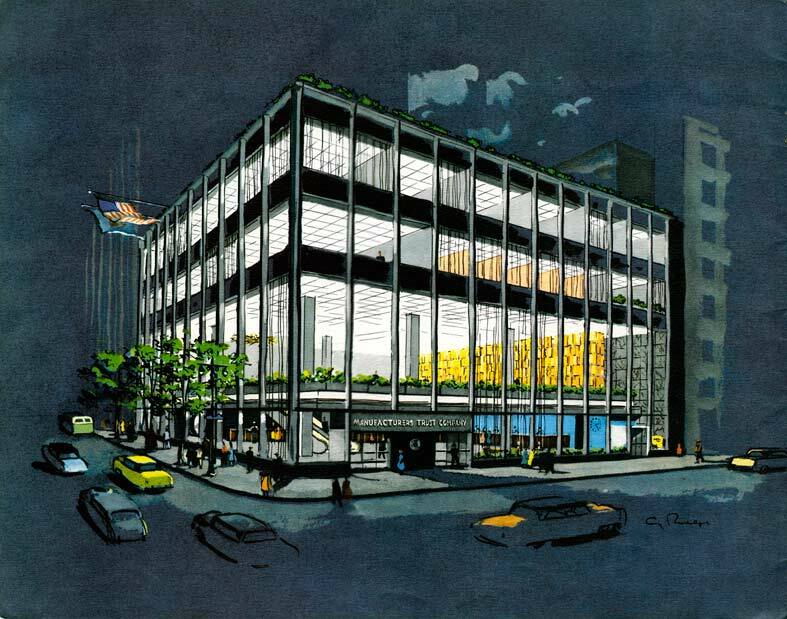 Rudolph took up the project, originally proposed by Robert Moses and blessedly halted by near universal opposition, at the behest of the Ford Foundation, in 1967. Where Moses proposed an elevated highway, Rudolph envisioned a trench straddled by a series of prefab, plug-in megastructures. The idea was to link the Holland Tunnel on the west side with the Manhattan and WIlliamsburg bridge crossings on the east. In plan it has the shape of an enormous Y, with Broome as the stem, and Canal and Delancey the branches. While it is architecturally more interesting than anything Moses had in mind, the effect would have been similar: wholesale demolition along the construction corridors and a walling off of entire areas of the city. 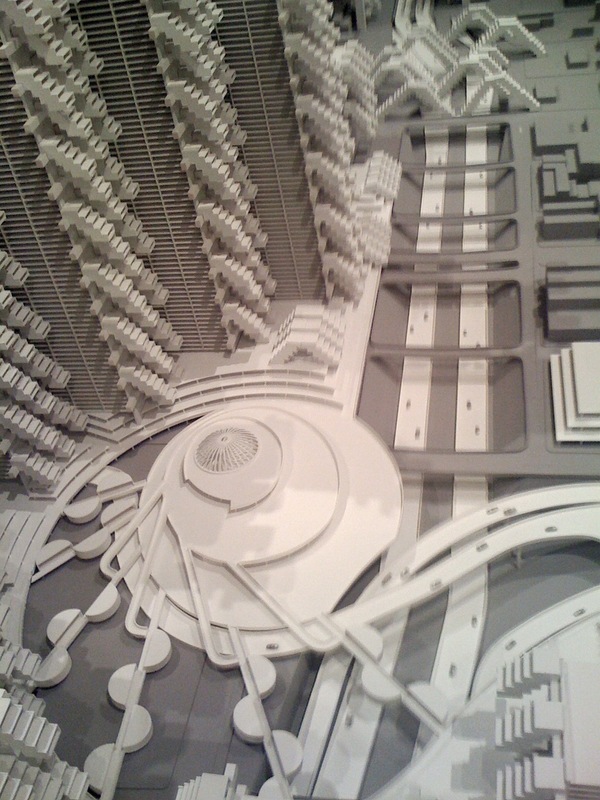 As Yael Friedman writes over on Urban Ominbus, “if you have lived in New York for any significant amount of time, the moment you fully comprehend what it is you are looking at in the exhibit, the drawings become utterly jarring.” The extraordinary model, I’d say, is even more jarring, and as much for what it does not present: the Lower East Side, which would have been cantonized between the project’s two eastern branches. One of the shortfalls of this small exhibition—and I hate to nitpick, because it is truly remarkable—is that there is no attempt to supplement Rudolph’s vision with contextual maps, drawings, or images of what it would replace. It is, in any case, something to see—an extraordinary vision, if not a practical one, and an interesting counterpoint to the Small Scale, Big Change exhibition now at MoMA, that seems almost a rejoinder to the grand ambitions of modernisms past. LOMAX certainly was that. A couple of years ago, when I first heard about Liz Cohen’s Trabantimino project, I knew it was genius. 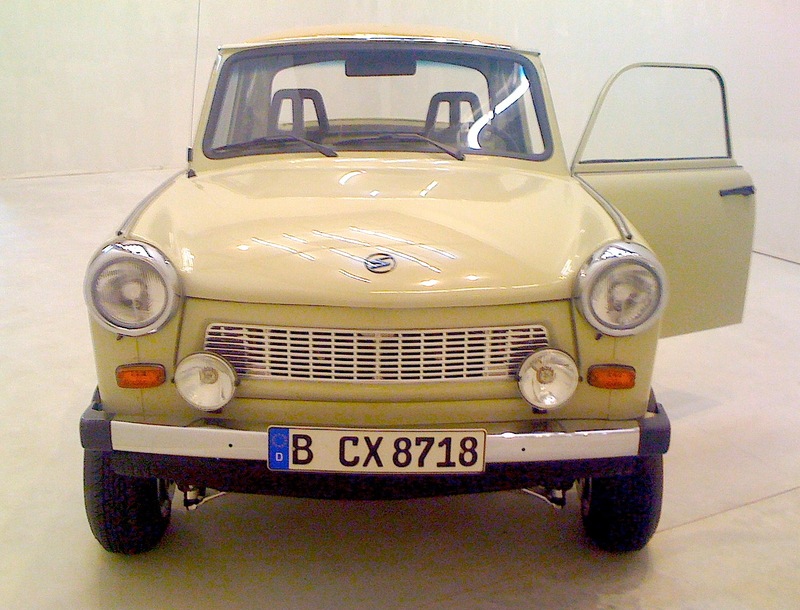 The idea: fuse a Trabant, that iconic East German junkmobile, with an El Camino, the classic American musclecar. There’s no way it should work, but it somehow makes sense when you see it, a wonderful hybrid, both butch and charming at once. Cohen, who is not your typical autoworker, did all the work herself, and beautifully: it’s as pristine as a Porsche, a creamy chunk of automotive candy, and god only knows how she got the thing into the basement gallery of Salon 94, on the Bowery. Don’t miss it. I know, as a New Yorker, one is expected to embrace change, but there are times when I just can’t do it. Case in point: Chase has shuttered its iconic bank branch at 43rd and Fifth, and I’m pissed and sad about it at once. 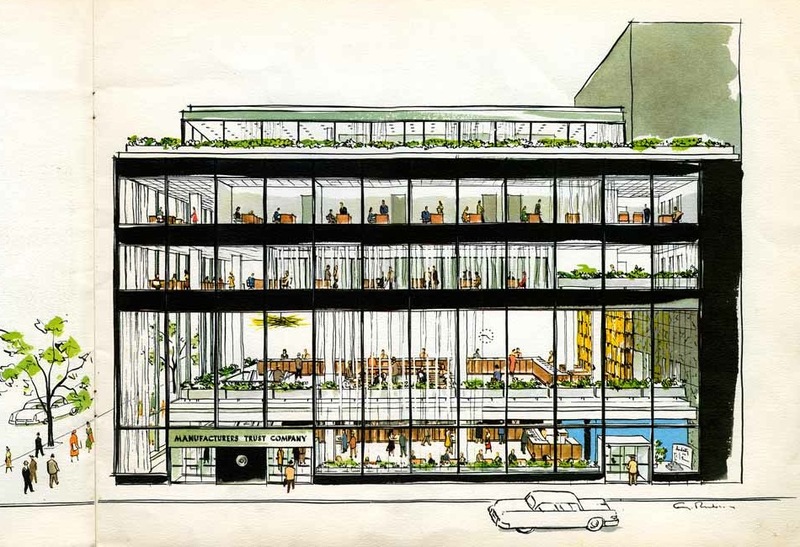 The crisp glass box, designed by Gordon Bunshaft of SOM, is [was?] one of the city’s great masterworks of modern architecture. It opened in 1954 as a Manufacturer’s Hanover, with its signature vault daringly visible from the street. A ride up its escalator deposited you in a limpid open hall, with a Harry Bertoia screen in the back. 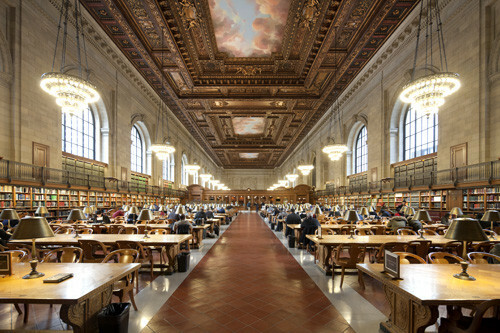 I knew the branch well, as I’ve written a couple of books out of the NYPL, which is just a block away, and I do my banking at Chase. I made it a point to deposit important checks there. It was an edifying space. It made you feel good to be in it, but not in a nostalgic, Mad Men kind of way, because it was still operational, not a museum piece. I liked to stand on the upper level, and just look out the window and watch the traffic on the avenue below: the Lubavitchers across the street, hustling office drones, street dancers, tourists walking along oblivious. How different it was from the traditional bank branch of an earlier time—think imposing classical facade of rusticated stone—and also the contemporary vulgarization of its own modern aesthetic. Now the Bertoia screen is down, and I know there’s a lot of concern as to its fate. I’m concerned as well, but to me that’s secondary to the hard blow that the bank might no longer be a bank. I suspect its fate will be similar to the wonderful old Scribner’s bookstore designed by Ernest Flagg just 5 blocks north on Fifth. It’s now a discount cosmetics retailer. That stinks. The charming illustrations above are from a promotional brochure distributed when the bank opened. What would Mies van der Rohe and Philip Johnson have thought of sharing the billing in Modern Views, the new book celebrating the Farnsworth House and the Glass House? 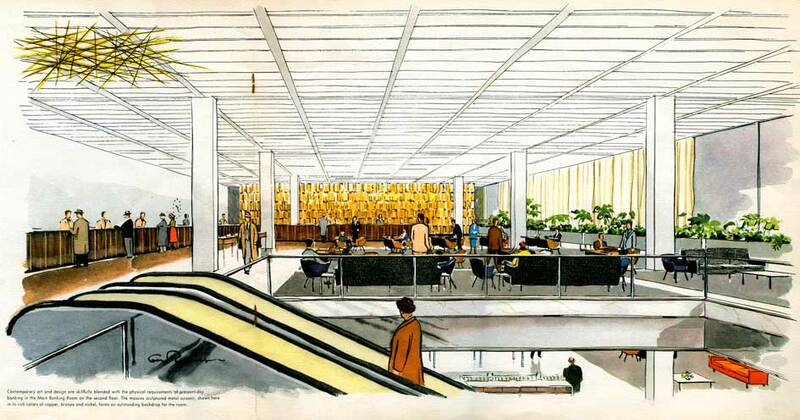 Mies, on visiting Johnson’s New Canaan pavilion, was so offended by the place that he refused to spend the night. Johnson, Oedipal son that he was, could be cutting about the “Old Man.” Still, at this point one can hardly imagine either man without the other. Fitting, then, that the two properties in question are administered by the National Trust, to which proceeds of the book, a collection of artists’ responses to them, will be devoted. Both face serious preservation challenges, and could use the help. While I’m at it, let me note that David Diao, one of the artists represented in Modern Views, has a show opening next week at Office Baroque, in Antwerp. 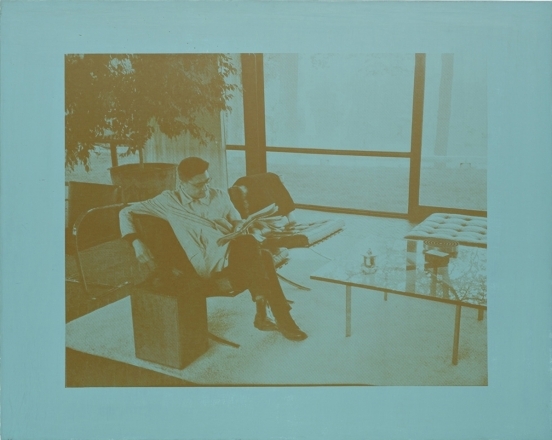 Johnson and the Glass House are frequent subjects of Diao’s work, which seems inspired by, among others, Warhol and Ruscha—both Johnson favorites. Johnson was less enamored with Antwerp. On a visit in 1930, he found it “dull and overcrowded with Flemish idiots.” Belgians, generally, he characterized as “dirty and disagreeable.” Favell Lee Mortimer had nothing on him, but at least give him credit for admiring the great Rubens Descent at the Antwerp cathedral. Frankly, I thought the Elevation would be more his speed. 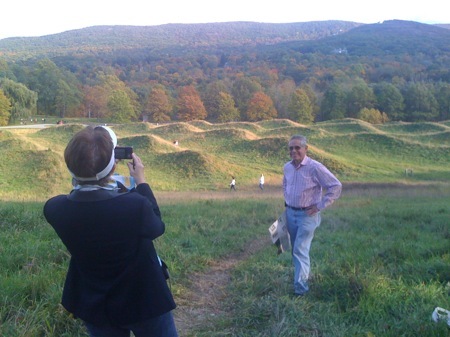 I went out with the family to see Maya Lin’s Wavefield up at Storm King Art Center over the weekend. I hadn’t read much about it, on purpose, looking forward to taking my own unfiltered impressions. It was a beautiful day to visit: one of those crisp fall afternoons, the foliage in hues from green to red, the light raking in dramatically. Even under these perfect conditions, I will admit I was a bit underwhelmed, though it is not unimpressive. The piece seems designed entirely to be viewed from an elevated perspective adjacent to the dune-like landforms. From there it is undeniably graphic. When we were there, a steady stream of visitors made their way up to the position, cameras ready. What I found disappointing was the piece when viewed from anywhere else, in particular within the undulating forms themselves. These are not manicured, but left rather wild and scrabbly. This is fine, except that docents yell at anyone who attempts to mount the crests of the waveforms, even though they hardly seem pristine or fragile. I was hoping that the piece would offer a series of shifting experiences and views, but instead one simply walks through a trench between the waves and then up to the privileged perspective. It all seems like kind of a lost opportunity. however impressive it might be. Still, a trip to Storm King is always worthwhile.